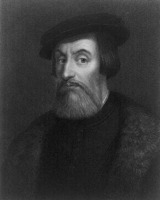 1 Hernando Cortes was born in Europe during the Renaissance. Of the many exciting options open to a young man of his time, he chose a career at sea. 2 In 1504, he joined other Spanish adventurers and sailed to Hispaniola in the New World. Today Hispaniola is known as the Dominican Republic and Haiti. It is southeast of Florida and Cuba, just west of Puerto Rico. 3 Cortes already had big plans. Soon, his plans began to come true when he was hired by Governor Velasquez of Hispaniola to lead an expedition into Mexico. Cortes started to assemble ships, men, supplies, and weapons for the journey. It appeared that he had more in mind than just a voyage of discovery and trade. 4 Governor Velasquez soon became suspicious of Cortes's plans and told Cortes that he was no longer in charge of the expedition. Cortes went right ahead with his plans anyway. In fact, he left as fast as possible before the governor could have him stopped. 5 He sailed to the coast of Mexico. Once on land, he began to make alliances with native tribes there. He found many people who were willing to join his expedition and who were willing to help him. He found people who could act as translators, too. 6 He also began to hear rumors that he had heard before - rumors that said the Native Americans of Mexico had gold, lots of gold. He learned that it was the Aztecs, who lived further inland, who were known for their beautiful objects crafted from gold. He learned, too, that their empire was centered in their capital city of Tenochtitlan. Along with his native allies, Cortes set off for the Aztec capital. 7 He soon arrived at the magnificent city. It was a spacious city built on an island. The city design included wide causeways and canals. Its buildings, including the king's palace and a large pyramid, were constructed of stone. 8 Montezuma, the Aztec king, welcomed Cortes and his troops. He gave Cortes and his men gifts made of gold and precious gems. Although they treated Cortes's party as guests, they must have also been suspicious of their intentions.